open archive was set up in a National Census Year to help add flesh to the numbers by collecting incidental stories, reports, thoughts and comments regarding life today in 2011. We started off with an empty ‘library’, but by the end we have collected almost 130 ‘documents’. A copy of the archive for 2011 will now be lodged at the Dorset History Centre as a resource for future researchers into everyday life in Dorset. The 2011 Archive will also remain open to be read by visitors to the open archive website. The 2012 Archive will open on January 1st 2012. Nationally the Big Stories will definitely include the London Olympics and the Queen’s Diamond Jubilee. What will be the local highs and lows? What will local people have to say through the year? Only time will tell. Why don’t you contribute to the open archive ‘library’? Why not submit a document for the ‘shelves’? Why don’t you speak to the future? It’s still hard to believe we are in midwinter. Last year at this time the ground was bone hard under snow and ice. Today the land is soft and wet, muddy where heavy agricultural machinery has churned it up. This year continues mild – officially it has been the second warmest on record. Today it was c12 deg C when I set out on a walk from Drimpton via Burstock to Pilsdon Pen, then back via Blackdown, Kittwhistle and Greenham. The land is as green as spring. In fact, I passed red campion and butterbur in flower and the gorse round Pilsdon Pen was in full bloom. Grass is still growing enough for the local farmers to have their stock out grazing. Flocks of sheep and herds of cattle were proof that the land is still being worked. On Pilsdon Pen itself a small flock of heavily pregnant sheep was quietly feeding while a lone buzzard circled overhead. From its heights and under a grey sky I could see out to the coast, and although the very top of Golden Cap was veiled in low cloud, the visibility was clear for miles. Inland it was possible to see the Blackdown Hills in Somerset and everything in between, Drimpton included. On Sunday December 18th. The annual candlelit carol service was held at the Chapel at 6.30 p.m. The Chapel was beautifully decorated with holly, ivy, a decorated Christmas tree and masses of candles. It was a traditional service of Lessons & carols with two sketches added which brought a modern twist to the telling of the Christmas story. We are so lucky to have Richard as organist and Anne who plays the violin and Anya who plays the flute. 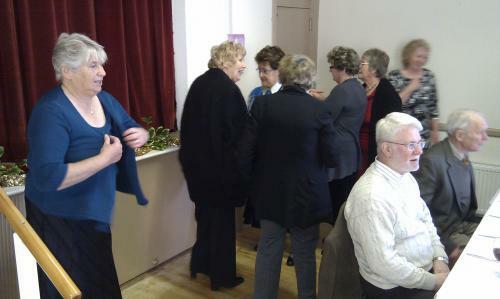 It was great to see the Chapel full with the usual small congregation and many friends and villagers. Coffee, tea and lovely home made mince pies were served after the service. The Chapel is struggling along financially as we have a small congregation of 15 regular members. The cost of paying the circuit for preachers etc. and heating and repair costs are not covered by collections and donations. The Chapel and adjoining old schoolroom were renovated a few years ago and the end part of the school room is rented out to 2 local artists as studios. The Community room, with modern kitchen and toilets is also let to groups who meet there and pay a small rent. We do some fund raising during the year. 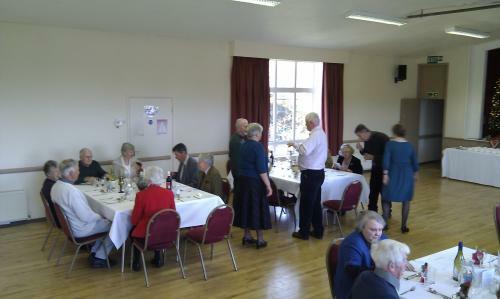 We have held a Harvest supper with entertainment, a Jumble sale and a Brass Band concert this last year. Next year, 2012 we have planned another brass band concert, a summer lunch and a concert showcasing the young musicians' talent in the village. There is talk of forming a village choir which will use the Chapel as the acoustics are good with the lovely wooden ceiling. Last night the village carollers - the once-a-year 'choir - met up at 6.30pm by the bollards between Marksmead and Applefield Road. The weather was mild, calm and dry after a day's rain - very different conditions from 2010 when it was sheet ice almost all the way! Almost 20 people - mostly men it has to be said - met up outside Mel & Maurice's for the now traditional starter of mulled wine and our first carol. Then we set off down Marksmead, lanterns swinging, banging doors as we went. It can be hard at times getting the message through the double glazing and over the TVs! But we are never deterred. At the end of Marksmead we spilt up into two equal groups. One group went along towards Netherhay before going along Netherhay Lane to Drimpton Cross and up Chard Road back towards the centre of the village. The other group went up Crewkerne Road and along Bridport Road to the edge of the village, before turning back down Chard Road, doing Applefield Road, Post office Yard and Oxhayes on the way. On their route the Netherhay 'choir' were entertained to drinks and nibbles on no less than four occasions, they say! The other 'choir' made do with a lavish selection of drinks at Manor Farm, where we were also called upon to sing as Carol accompanied us on the piano. Our singing may not have been of the very best quality - several notable singers being absent this year - but we went at it with gusto and as a result of our tin-rattling on behalf of charities for the Homeless at Christmas we collected £214.06, which is a great total especially as so many people are feeling the pinch in these difficult economic times. Almost as if it was planned, the two groups met up midway along Chard Road, before heading to the Village Hall where Rosemary was waiting with seasonal treats and mugs of steaming hot chocolate. It was good to sit down with the feeling that we had done a good job. 18th December 2011 Alan and Jackie Scutt, the present owners of 'Brookfield', invited guests for Christmas drinks. Discussing the previous owners and use of Brookfield, particularly the outbuildings, with Alan I thought to record something for the archive. Up to 1996 the outbuilding had been used by a light engineering business. The next owners were Monty and Jenny Angold, Monty used part of the workshop for repair of optical instruments and Jenny had her artist's studio in the other part. 2004 saw new owners Wendy and Angus Sandeman with an ambitious plan to rebuild the workshop/studio as a Dental Surgery. Wendy ran a private Dental Practice but was very popular for her gentle and caring work. Angus kept a group of Alpacas in the field which could be seen from the surgery! The Dental Practice moved to Crewkerne in 2009 and current owners Alan and Jackie have worked hard to convert the old surgery into a beautiful holiday let which is already attracting holiday business into the village. Only a week to go to Christmas Day and I’ve been eating my way towards it at four of the village Christmas Lunches. 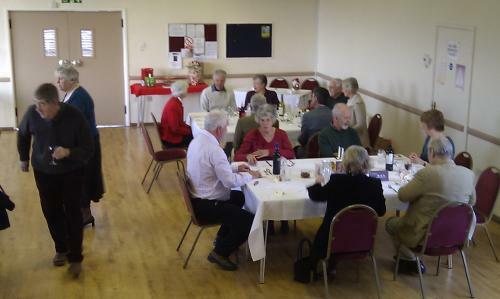 The first was the Bowls club meal held at the Royal Oak on the 25th November, a lovely meal and great company. The 28th November saw the church's Advent Lunch; this time not a traditional meal but cottage pie followed by yummy puddings. This was enjoyed by over 50 people. This was followed on the 7th December by the Light Lunch Ladies offering of Christmas Lunch; this was a traditional Christmas meal and, of course, it was followed by a good array of puddings including Christmas pudding and mince pie. This year we had 65 friends join us. 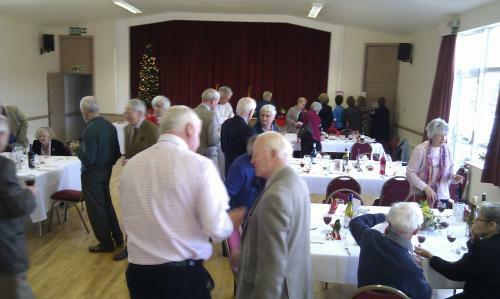 The last Christmas meal for me was the Garden Club's lunch at Clapton Village Hall, lower numbers than last year but a pleasant gathering and meal. The first and last meals I sat down and ate with everyone else; the other two I was one of the crew who prepared, served and helped to clear up at the end. Oh, I did get to eat some as well, an exhausting time, but one I still can look back on as being enjoyable. The next Christmas meal will be our family meal on Christmas Eve and then this lady will be glad to see the back of all the fuss over food. 'The Broadwindsor Group Parish Plan, sponsored with a grant from the Big Lottery Fund, has moved on a stage. The questionnaires have now been gathered in and thanks to the great efforts of John Heys and his team of helpers there has been a phenomenal response rate of 65%. Even more gratifying has been the fact that every part of the parish has responded so well, with the lowest return from any district being 57% and the highest 76%. Drimpton and its satellites polled 66%, whilst Broadwindsor itself returned 64%. The questionnaires have already been inputted on to the computer by Charles Lawrence and his team and now the disks have been sent for independent evaluation, with results from this expected in mid- January. Although not finally ratified as yet several key points are emerging, the concern over potholes despite the recent road re surfacing programme of many of the roads, a desire to retain the First Responders, and the encouragement for a Community Store. 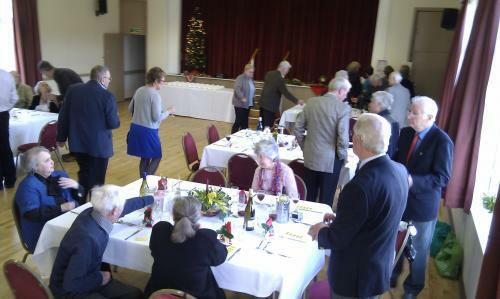 On Thursday 15th December, round about 40 members and friends gathered in Clapton Village Hall for the annual Christmas luncheon of the Clapton, Wayford and District Horticultural Society, which holds most of its meetings in Drimpton Village Hall - we like to keep things simple. Helen Furness exceeded our expectations, giving us a wonderful meal, thank you to her and her team. Here are a few photographs as we gathered. Rosemary's table ready, except for her! “ The efforts to set up a Broadwindsor Community Store took a step forward in November with the setting up of an eight strong committee to explore options available. The submission for a grant towards the Community Shop has got through to the second round of the national competition for grants run by Village SOS. A more detailed plan is now required at this stage with entries to be in by 2nd February 2012…. The attempt to Save Our Broadwindsor Shop (now known as SOBS) has gathered pace… The independent valuation of the Village Shop has now been conducted and as a result of this the Shop Committee has put in an offer to the selling agent Chesterton Humberts. At the recent Committee meeting suggestions on raising the money needed through grants, loans and community schemes was discussed and advice is being taken on these. Members of the Committee are scheduled to visit other Community Stores in the area in order to see best practice and use the information to help build the Business Plan.